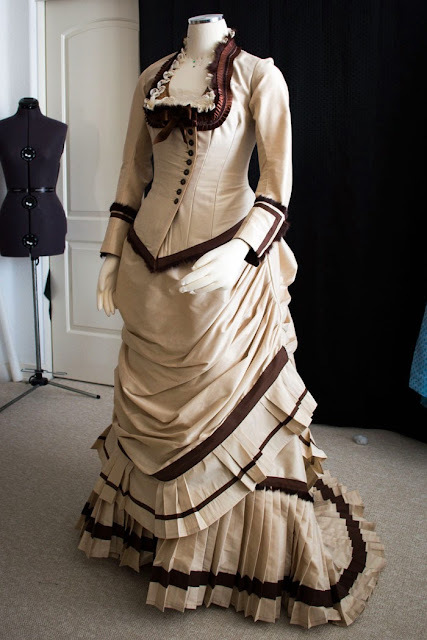 Last weekend I finished up and wore my new 1879 "Cafe Promenade" dress (or "Creme Brulee" or "Cafe Au Lait"), which I had quite a good time putting together over the previous few weeks. The bodice was crafted from Wearing History's 1879 Victorian Dinner Bodice "Resto-vival" E-Pattern. This is the first time I've ever used an e-pattern, and was a little dubious at first, worried that I would get the scale on the prints wrong, or just not get through the taping together of so many sheets, etc. I was surprised how easy it was. 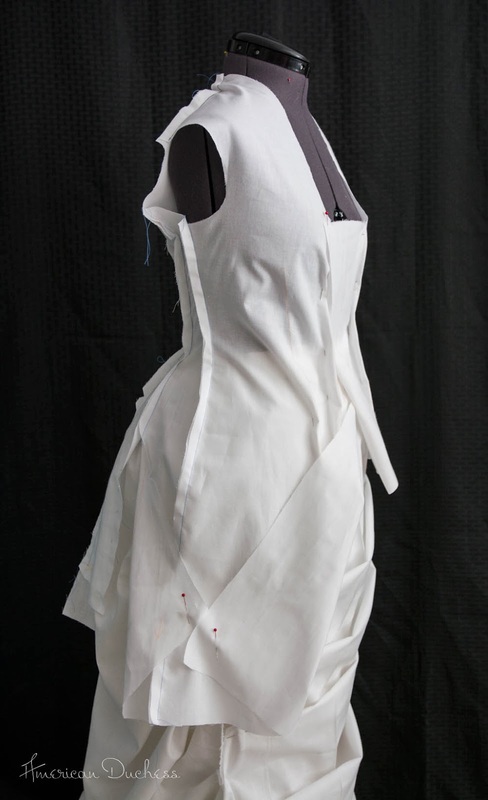 Wearing History provides easy-to-follow directions on how to print the pattern and assemble. Each page is numbered, and it's easy to see how the pieces go together. 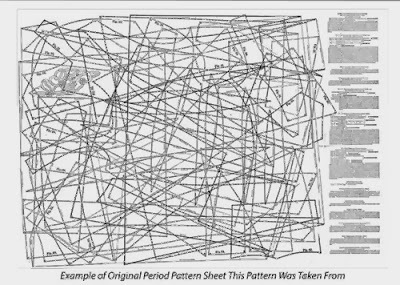 I was impressed with the notes about the pattern, as well, though there are no construction directions. I was also impressed with how nicely the pattern went together. Points lined up as they should. Things were trued, and matched nicely. Wearing History notes that the center back pieces are longer than the side back pieces, at the hem, but I concluded, based on how accurately every other point matched, that this was entirely purposeful. 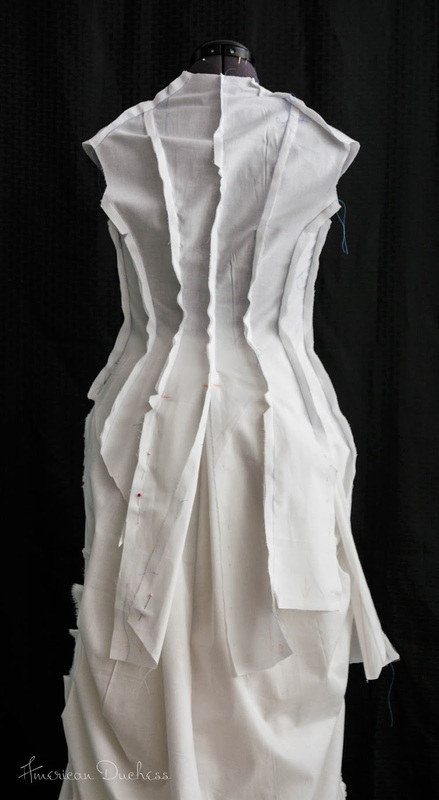 The turn-backs on the bodice didn't match up, and were way longer than they appear in the illustration. I found these tails to go down almost to my knees, which didn't work for my proportions. I was also confused by what to do in back - more turn-backs? leave straight? - as there's no back view for what it was originally intended to look like. I avoided these weird bits altogether by cutting a new line for the hem, which was easy to do. The bodice has quite a few pieces, making it easy to adjust to my size, which was a tad smaller than the original measurements (when does that ever happen!?). I took quite a lot of excess out of the armscye area in back, but I think that might have been a mistake, as I realized later that the sleeve is actually a drop-shoulder, rather than right on the shoulder, as it appears in the illustration. This was my mistake - I ended up with the front bodice piece dropping off the shoulder, and the back being cut toward the shoulder blade. Weirdness, and not the most comfortable. 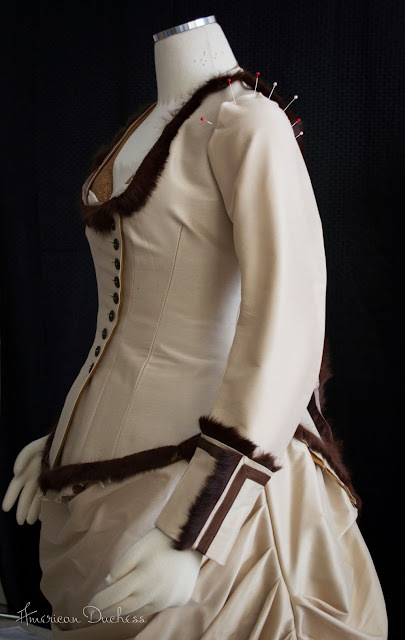 If I made this bodice again, I would cut the armscye fully on the shoulder point. Once I worked out my mock up, I cut the pattern from the silk/cotton fashion fabric, and a medium-weight brown twill I had in my stash. I flat-lined each piece together, then worked the front asymmetrical button closure, before assembling all the other pieces. 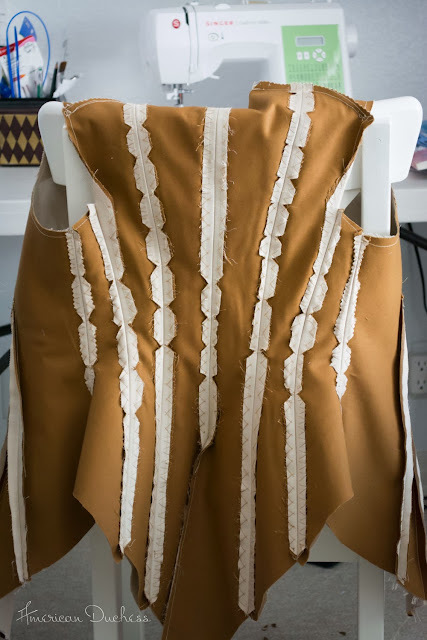 The last assembly step was to do the darts, but what I *should* have done was add the boning to all of the seams before doing the darts, because I ended up "shrinking" the garment a bit too much, and having to let the bodice out at the buttons. No biggy, but a lesson learned for the future. I worked the seam allowances according to bits from "Authentic Victorian Dressmaking Techniques," a great book to have. The pattern included a two-piece sleeve that was longer than the one shown on the pattern illustration - about mid-forearm length, with a cuff - which I liked, but I decided to go with a full-length sleeve instead. I frankensteined the included sleeve pattern with a two-piece shapes sleeve I knew fit, but in retrospect I perhaps should have just stuck with the original sleeve. I ended up with weirdness near the top of the sleeves in back, which I think stemmed from my misunderstanding the armscye design. I really like this pattern. Despite changing bits of it, and going rogue on some parts (to my detriment! ), I will definitely use this pattern again, and recommend it for advanced seamstresses. It's easy to assemble, affordable, and completely authentic. You'll need some experience to put it together, and I definitely recommend doing a mock-up, just like any historical pattern. You can find all of Wearing History's patterns - print or e-patterns - at www.wearinghistorypatterns.com . The 1879 Dinner Bodice is here. Thank you for an excellent post. Like you, I've been very nervous about e-patterns (or more accurately, about my ability to use them correctly! ), so it was reassuring to hear that you had such a positive experience. Thanks too for the construction details and the 'lessons learned'. So many talented people posting in the HSF seem to produce beautiful work effortlessly, and right first time. It's good to know that I'm not the only person who has the occasional "moment"! Thanks! I seldom get things right the first time...or second or third times, haha. "Moments" are a regular thing. I think my biggest "moment" of 2013 came the night before my wedding, when I put on the gown and it didn't fit. I'd make a test garment and everything, but that sucker wouldn't close for love nor money! I just bought 2 more of Wearing History's ePatterns, for a 1940s and 1930s blouse. I'm excited to print them out and get taping. :-) She makes it easy to do. I can't believe I missed this. I love it. I saw it in your recent post, and I was like, "I don't remember her making that!" It's so wonderful! Great job and I like the color choices. Thanks! It's one of my favorite costumes I've made...so far!